The DreamLine Infinity-Z sliding shower or tub door offers classic style with a modern touch. The Infinity-Z will transform your bathroom with a beautiful balance of functionality, elegance and sophistication. A variety of finishes and glass options will match any bathroom decor. The included SlimLine shower base completes the look with a low profile design for a sleek modern look. The base has a glossy acrylic finish that is scratch, slip, and stain resistant for safe showering and is reinforced with fiberglass for durability. Plumbing codes vary by state, DreamLine is not responsible for code compliance. Drain opening fits any standard 2 inch compression fitted drain (Drain not included). MOST ECONOMICAL FRAMED SLIDING MIRROR DOOR. THIS TOP ROLL DOOR HAS A ONE PIECE TOP TRACK FOR EASY INSTALLATION. 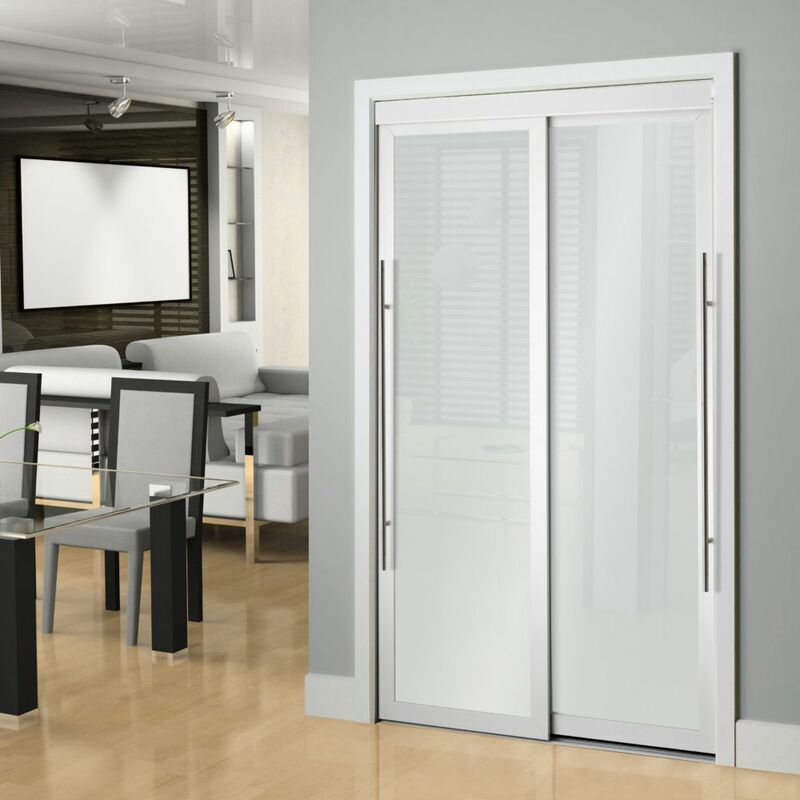 Bring contemporary flair to your home with this Erias Home Designs Baldarassario Sliding Closet Door. The frame of this door is made of high-quality laminated wood, which ensures strength and durability. It is available in multiple finishes and sizes for you to choose from. This two-panel sliding door features a 4 mm tempered frosted glass, which provides strength and rigidity. It features elegant satin nickel pull for easy operation. This bifold closet door includes matching fascia to complete the look. This Baldarassario Sliding Closet Door by Erias Home Designs features 1 Lite framed sliding closet doors with frosted glass for the perfect finishing touch to any room. 48-inch White Framed Frosted Sliding Door is rated 3.0 out of 5 by 1. What is the rough opening for this and do I need to install my own jambs with this or are they included? Not sure what the rough opening is. But whatever the specs says it is it fit perfectly. You don&rsquo;t need to buy anything else if your just replacing a door. Is the frosted glass at all see-through; it's listed as opaque but it is hard to tell from the photo? No you cannot see through it. Installed these doors and the botton wheels drag. Tried adjusting the bottom screws on the doors and it's still not gliding smoothly. Is it possible to adjust the top spring? If so, how do you adjust the spring? Any suggestions would be appreciated. I had installed two of these sliding doors. The 1st one I had no problems. The 2nd one I have had the same problem with the door on right draging at some spots. I have adjusted the the bottom tention and it seems to be working ok. Is the rails top and bottom level, that could be the problem. Also, there should only enough tention to keep the wheels in the track. Hope this helps. Will this 48&quot; sliding door fit an opening of 37.5&quot;? where can I get the pull handles for these doors? Can I replace the frosted glass with mirror? Does this item come complete with hardware for installation, if not what other items do I need and at what cost? Can I get this door in 60&quot; and if so what would it cost? I saw 60&quot; in store. Didn't check price.